But none of us could remember such perfect conditions. The weather the previous week had been a mixture of gales and heavy rain, the Metcheck forecast for Saturday giving a ‘too good to be true’ prediction, but it was 100% accurate! Parking at the large lay by on the A82 we ‘togged up’ as it was bitterly cold. 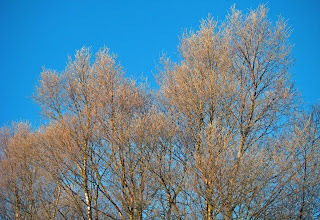 David mentioned -6c, it certainly felt colder. Climbing over the stile and walking over the frozen bog we headed down to the sheep creep under the railway. The farmer and his collie were just in front of us. After such a cold night the farmer was scanning the hill checking his flock. In front of us were 2 large parties. Bill commented that it was Redshift and the Doppler Effect; the party just in front being the Moray Club 10 years ago, and the party in front of them being the Moray Club 20 years ago! We all had a good laugh when David quipped the tourist coach in the lay by is the Moray club in another 20 years! The Twistin Hill ridge gave us magnificent views. Views west were good, really spectacularly good. Cruach Ardrain looked impressive across the coire. 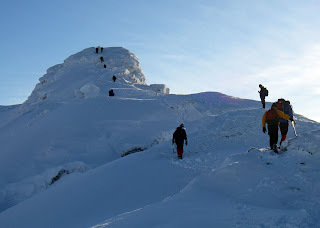 The last bit of climbing took us to "The Castle", which was totally banked out with snow. It was all very Alpine, reminiscent of the Mont Blanc Bosses ridge! 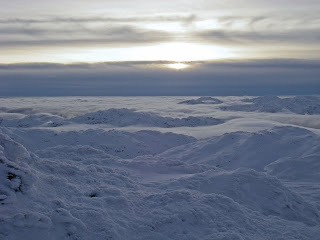 Views south revealed the central belt totally engulfed in thick freezing fog. It was great to be soaking up the sun, although the gentlest of breezes on the summit brought a severe chill to exposed flesh. 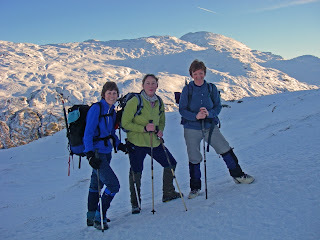 Beinn a' Chroin looked fantastic in winter conditions and we wondered just how tricky it would be. Elizabeth and Dee decided that they would return down the up route with Andy David Roni and Bill continuing on. Heading down to the col at about 800m, a rake left, above some large ice falls, gave easy-ish access to Beinn a' Chroin's summit ridge. 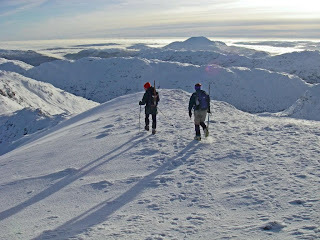 Beinn a' Chroin's north ridge was our descent, a 20 minute run from summit to glen floor. 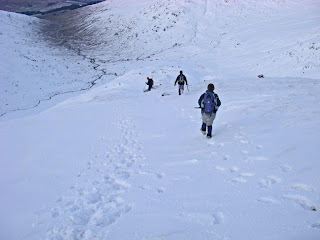 Andy took his crampons off and was promptly faced with an icy infant River Falloch to cross! This whole area is usually one big bog. Today it was frozen hard and we made excellent time. Although An Caisteal was busy, it didn’t detract one little bit from our day. It was good to see so many hillgoers enjoying a fabulous day. 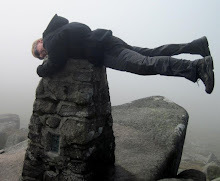 Are you the crazy hillwalkers that my wife and I met at the top of Ben Lomond on Sunday 23rd. December? Let me jog your memory; you were all drinking champagne and eating pakora and mince pies and one of your party members kindly took our photo. We recognised a few of the faces, you look a fun bunch. Keep up the good work, excellent blog. We always try to have fun, no matter what the weather is! Thanks for your kind words. 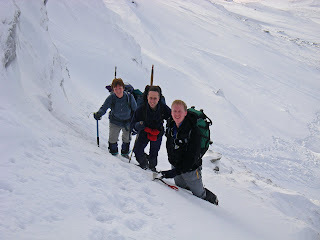 We have got two months to train for our next An Casteal trip. If I remember correctly winter started on the 30th November last year and didn't end until June.